This Lemon Concentrate is manufactured using lemons cultivated near the company facilities. Once the harvest is done, lemons are sent to the factory for them to be processed. 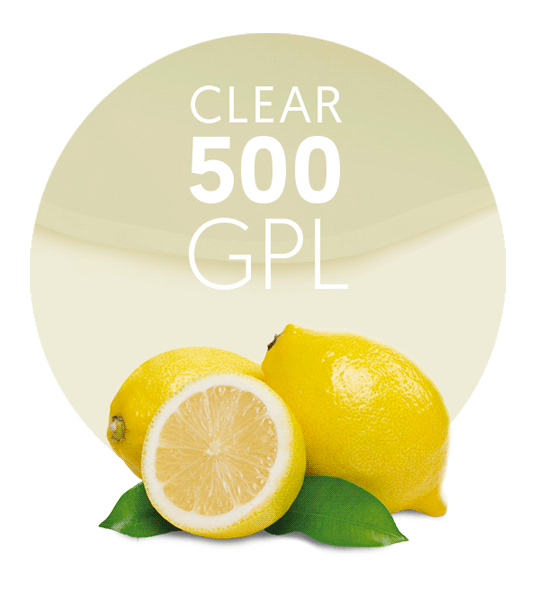 Frozen Lemon Concentrate 500GPL Clear is made from Spanish varieties of Citrus Limon. These lemons grow in the Mediterranean region, and benefit from its wonderful climate, warm during the day and slightly cold at night, which is the main reason of its intense flavour and taste. Our Lemon Concentrate 500GPL Clear is ideal for the production of soft drinks and beverages, and can be reconstituted by dilution with water in order to reach the Brix of ready to drink product. It may be applied in many other product types, such as ice creams, jams, syrups, or dairy products. As this product states in its title, Lemon Concentrate 500GPL Clear, it has a higher GPL, therefore it is sweeter than the Lemon Concentrate 400GPL. Although this product is sent frozen many times, it may also be sent in aseptic, in a metallic, cone-shaped drum, covered with a plastic lid. If this were the case, it should be stored between 4 and 10 degrees Celsius. Lemons that do not meet the quality levels, for consumption as fresh fruits or for processing, together with the pulp and peels obtained from processed oranges, are diverted and used to obtain by-products. Lemon Concentrate S.L. is located in Murcia, in the South East of Spain. We have more than 50 years of experience in the food processing and fruit concentrate industry. Today, we are the one of the leading companies in the supply of lemon, orange, mandarin and clementine products, but our portfolio includes many other fruit varieties such as strawberry, pomegranate, white grape, red grape, pineapple, apple, white grapefruit, pink grapefruit, watermelon, melon, guava, kaki and peach. We offer many types of sub-products of these fruits, for instance, essential oils, pulp cells, purees (comminuted), juice concentrates, fruit concentrates, and NFC juices.